Sharon Ní Bheoláin reads in Dublin for 'Words on the Street'. Photo: Damien Eagers. Louise Stokes, Frances Jewitt and Designer Lulu Frost at the exclusive Lulu Frost Trunkshow with Loulerie held at the Cliff Townhouse in Dublin. Photo: Kieran Harnett. Bressie and author Louise O'Neill at the Alex and Ani talk Series in the Westbury, Dublin. Temple Bar gets a bad rap. Yes I know it's the first, and only, station of the cross for Liverpudlian hen parties - but there's more to the place than L plates, kebabs, and pub crawls. Most of the time. This week, the good folks at the European Literature Night enlisted 12 broadcasters, writers and actors to read extracts from 12 different books at 12 different locations around Temple Bar. Book worms ran from location to location catching snippets of text. "It's like a pub crawl," broadcaster Pat Kenny said. "Except without alcohol, pubs or music." So not really like a pub crawl at all then. Kenny, who was reading the work of Spanish screenwriter Nicolas Casariego, joined the line up which included Sharon Ní Bheoláin, Steve Wall, Elaine Crowley, and Owen Roe. BAFTA nominee David Nicholls took to the stage in Meeting House Square and drew an impressive crowd. "This is my first time reading in the open air," he said. "It's my Glastonbury moment." I was happy to hear Nicholls, who wrote the wonderful movie Starter For Ten which introduced James McEvoy to the big screen, is now putting the finishing touches to his latest screen play. "I am working on a TV series based on Edward St Aubyn's Melrose novels for Sky Atlantic and my first stage play. "After which I need to start doing some proper work and finish a book," he laughed. In City Hall, DJ Ruth Scott talked wedding plans in between readings. Ruth and her other half, hotelier Rob Morgan, will tie the knot in Bunratty Castle next July. "He's the bridezilla - I'm very laid back and I won't be going for a traditional white dress - it does nothing for my skin tone," she said. From one bookish hooley to another, Late Late Show host Ryan Tubridy was on hand to congratulate his pal PJ Lynch on becoming Ireland's new Laureate na nÓg. Tubs and Lynch have just finished working on picture book, Patrick and the President, which tells the story of Kennedy's 1963 visit to Ireland through the eyes of a boy. "The office is in safe hands with Ireland's finest illustrator," Tubridy said gesturing to PJ. But the man himself remained modest. "It's all very scary and daunting at the moment but I'm looking forward to getting started." That's the spirit. Here's trouble; Master of the quadruple entendre Al Porter (below) is teaming up with everyone's favourite X Factor judge Louis Walsh for his latest TV project. Louis will make a fleeting cameo in Al's new comedy short for Sky. "It about a clueless karaoke singer who lives with his nan and is best friends with an aging drag queen with one leg," Al explained. "It's loosely based on my life, very loosely." The show is being produced by Baby Cow - Steve Coogan's production company and will also star Pauline McLynn. Comic Jason Byrne and Sharon Horgan have also penned an episode for the series called The Rug. Amy Huberman will play Jason's wife in the show. "I'm over the moon," Jason said. "At first I thought Amy would be too good looking but we 'roughed her up' a bit for the part." 'Do you like monkfish, Bairbre?" enquired Michelin starred chef and Ireland's favourite haute cuisine restaurateur, Ross Lewis. I nodded enthusiastically - to be honest, I was still busy scoffing the asparagus risotto he had served me earlier - and Ross proceeded to create a bespoke plate for me of - carpaccio of monkfish - while others had to make do with serving platters. Such VIP treatment! On Wednesday night, the House of Peroni unveiled Amare L'Italia (For the Love of Italy) with a series of immersive Italian food, drink and cinema experiences. It wins the 'gig of the week' hands down with a great sociable crowd, super food and striking blue skies, which was kind of vital because we were outdoors...on the roof of the Trinity Street car park. Peroni Nastro Azzurro's global brand ambassador, Dublin-based mixologist Federico Riezzo, devised a number of infusions using the beer as the main ingredient. His spritz - all gone when I arrived - was like an Aperol, that Italian aperitif which everyone is ordering and he certainly gets the prize for being inventive. His 'Neroni' featured squid ink and charcoal gin while his Roman Mule had spiced rum, ginger and refreshing lime juice. Like all the best Irish parties, some of the best chat and fun was in the kitchen chatting with Ross and his fellow Michelin-starred chef, Luciano Tona and together, they run Osteria Lucio in Dublin's Docklands. In the kitchen, I met the charming Manuela Spinelli (pictured above right) and if she looks familiar, that's because she used to pop up on our TV screens all the time, translating for former soccer manager, Giovanni Trapattoni. I bumped into stylist Aisling Farinella who has curated an exhibition of photographs by Rich Gilligan at the House of Peroni next Wednesday. Prize for the second best party of the week goes to Louise Stokes of Loulerie for hosting a trunkshow party for visiting NYC jewellery designer, Lisa Salzer, founder of the popular Lulu Frost brand. A 10 foot garland created by Ruth Monahan of Appasionata draped the antique dining table in the private dining room of the Cliff TownHouse and nestling beside eucalyptus, peonies, and lisianthus in graduated shades of white through to dark pink were Lisa's one offs. Guests included Catriona Mooney, Gillian Matthews, Breffni Horgan, Margaret Troy, Emma Coppola, Maria Fusco and Eimear Kelly. Afterwards, Louise brought Lisa and her assistant, Ashlee, for dinner at Luna and they visited Finnegans, Dalkey and new hot spot, Wanderlust. What better way to start the day than with a ukulele solo, backstage gossip and a poached egg. The Westbury Hotel was humming this week as Electric Picnic hosted its International Breakfast Banquet. The Ukulele Collective swayed with lei around their necks while guests talked outlandish tour riders and tucked into a full fry. "Mannequins, colour coded jelly beans, thrones, puppies - they've asked for everything and anything," one former roadie said. Chefs Kevin Thornton and Derry Clarke sampled the raspberry pancakes while Newstalk's Tom Dunne told me all about the 'Vinyl Breakfast' he'll be hosting in Stradbally. Tom will select the songs while his wife Audrey McDonald - of celebrity haunt The Cookbook Cafe will whip up food. Audrey worked as the Rolling Stones' personal chef so is well used to rock star demands. Later in the week, I headed along to the Westbury again for Alex and Ani's Talk series. The event was hosted by 2FM's Louise McSharry whose book My Life in Ups, Downs and Crisp Sandwiches is due out in a matter of weeks. "I got the first copy this week - it was surreal," she said. The early morning deluge killed my enthusiasm for golf at the K Club so I headed to Sandymount on Thursday for lunch with RTÉ's Bryan Dobson and Nuala Carey. And what did we have? 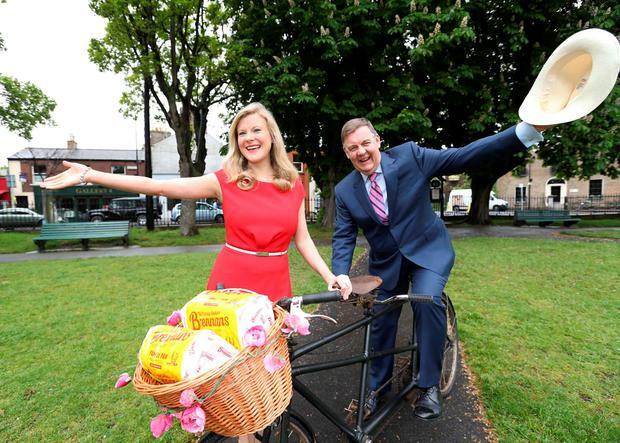 Well burgundy and gorgonzola sandwiches to be exact and there was method to our madness as they launched the Brennan's Bloomsday Bike Rally for the Irish Youth Foundation which takes place this year on June 10. In Ulysses, Leopold Bloom enjoyed that very same repas in Davy Byrnes in 1904. The weather cleared up nicely for the photos - but of course Nuala had predicted that. Busy Nuala is training for the mini marathon and last night she judged the Carlow Rose of Tralee in the Woodford Dolmen Hotel. Next week, she is off to Sligo to meet the people of Ballymote, as part of an 'RTE Audience Council' initiative. Funds raised in the IYF rally will go to Fighting Words - set up by Roddy Doyle and Sean Love to provide free creative writing classes to over 5,000 young people. Hands up who takes guilty pleasure in watching Bravo's Housewives of Orange County tv show? I'm thoroughly intrigued by their particular brand of frank friendship, and the show's stars enjoyed a short cast break in Ireland last week with Vicki Gunvalson (pictured inset - she has a new man after breaking up with Brooks Ayers) leading the way. I spotted the lovable, straight- talking Shannon Beador, Tamra Judge, Meghan King Edmonds, the newbie Kelly Meza-Dodd plus striking brunette Heather Dubrow, whose plastic surgeon hubbie, Terry Dubrow, is a household name in America after appearing on The Swan and now on Good Work. The OC gals stayed at the Powerscourt Hotel in Enniskerry, where guests were gobsmacked to find who they were sitting beside in the spa. They filmed at O'Flaherty's Temple Bar which tweeted about its celebrity guests. These glamazons know how to shop and there was a serious amount of retail therapy at Avoca in Kilmacanogue where they were also spotted enthusing about the colourful plaid throws. The show airs this autumn. Amy Mulvaney While the life of a travel blogger may seem idyllic, it's not all sun, sangria and sea, as these four Irish women have revealed. International Women's Day: Are you a feminist? Caitlin McBride and Sophie Donaldson To mark International Women's Day, we asked six Irish women what feminism means to them today. Hat or no hat? Heels or flats? Vintage or new? I'm with Mark Twain on this. Temple Bar gets a bad rap.